The city has an expanding University population – student numbers are increasing every year and there are many more foreign students seeking accommodation, which makes for a robust rental market in areas like Headingley close to the University. The University has a very good reputation probably ranking within the top 10-15 in the UK. Many buy-to-let investors have already bought in Headingley and there seem to be many “To Let” boards outside the houses, so it’s worth checking whether the market has been flooded or not. The nicest though most expensive areas are in Little Woodhouse, Woodhouse and around Woodhouse Moor Park. The more fringe areas of Hyde Park, Burley Park and Headingley Hill are also popular and a bit cheaper. There is talk that the university is planning to buy tower blocks in Holbeck (L11) just south of the town centre and refurbish these – this could transform this area for the better if it happens – prices of Victorian terraces are about three times cheaper in Holbeck than in the leafiest parts of Headingley. Beyond doubt, Leeds is the biggest and most important town in Yorkshire and acts as a focal point for investment and services. There are about three million people living in the conurbations in West Yorkshire, and Leeds is the biggest retail and employment centre, and ranks with cities like Manchester and Birmingham although its population is smaller. The rental market is strong with rents quite reasonable – because property is still quite cheap (say 80,000-100,000 pounds for a 4 bedroom house) yields are attractive. To reduce void periods to a minimum, I would recommend purchase of property close to the city centre and University (within 10 minute walk), although prices of substantial houses in these districts are far higher, sometimes up to 250,000 pounds in parts of Headingley. Leeds is only 7 miles for the expanding Leeds-Bradford airport to the north-west of the city – this airport has low cost flights to London, other UK cities and mainland Europe. Leeds is very well served by the M62/M621, the main Manchester – Leeds - Hull motorway. Access south using the M1 is also easy. The motorway passes very close to the city centre so access is good. The Leeds-Liverpool canal has many new warehouse and new-build developments overlooking the waterfront – regeneration begun some years ago. The new environment is ideal for city professionals who want to be close to work – many working in the financial and services sectors. Headingley has all but been regenerated – it is now (again) a leafy middle-class suburb with a vibrant feel about the place because of the young student population. Many wealthy professional families have moved to this area because it has some good parks and is close to the financial district. Holbeck to the south has just started the regeneration process – it is very close to the financial district. The area currently has problems with high crime and unemployment, but this is likely to improve in the next 5 years. Four bedroomed Victorian terraces can still be bought in fair condition for about 80,000 pounds – these could double in price if the area improved significantly. There is a rumour that Holbeck will be re-categorised as L1 (from L11) since it is so central – though I have doubts whether this will happen. More importantly, if Leeds University make halls of residence in the area, this will help rejuvenate the suburb. 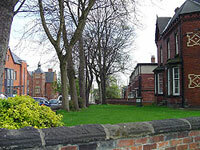 I favour a small area between Domestic Street, Ingram Road and Top Moorside – these cheap red brick Victorian terraces are bargains – they are difficult to find for long on the market since canny investors have already identified this area – in part because of its excellent communications. The area is only ¾ mile from Leeds station, 1 mile from the financial district and ¼ mile from Junction 2 of the M621. A bit further out in Beeston Hill (Tempest Road) is an area that is just beginning to re-generate. There are many interesting and sometimes abandoned properties that overlook Cross Flatts Park – this is a high risk area, but I believe its proximity to Leeds centre and the M621 motorway, and very low prices provide attractive opportunities. Unemployment in Leeds has already come down dramatically from its highs in the 1980s – I would envisage unemployment to come down still further, particularly in the poorer suburbs. This should support rental demand and house prices. The increasing financial and services sectors is excellent news for Leeds – it is now recognised as UK’s second financial city after London and this should attract further companies into the area, some moving from London to the lower cost Leeds area. (See ripple effect house price charts). Leeds was about the first city for prices to pick up in Yorkshire, some three years ago – the city’s prominence as a financial centre for northern England and large high quality University were two reasons, along with re-generation and new off-plan developments in Leeds L1 city district. Headingley prices tripled as this leafy Victorian area with high student population close to the city became trendy. Expect a ripple effect fanning out from L1/L2/L3/southern L7 areas (central and Headingley) as people become priced out of these areas. There is also a general south to north ripple effect with the north playing catch-up to the south for house prices. However, a word of warning is the high price of city centre new-build apartments – these can be almost as expensive as London – I would avoid buying these because of the large downside if prices drop generally in the UK. Better off-plan bargains can be had in East London. My preference is for Victorian terraces in regenerating area for maximum yield and capital value increase. Many of the early bargains in Leeds have been taken, but if you spot the up and coming areas and use your powers as an investor (no being in a chain with finance raised), then you can still pick up a bargain which has a high yield and good potential for capital gains. For higher risk/ reward, Holbeck is worth a look. For lower risk/reward with lower yield in an established trendy area, then Headingley or anywhere very close to the L1 financial district would seem appropriate. If you can find a terrace house close to or overlooking a park, on a leafy quiet road, close to L1 this is even better. But you will find plenty of competition and you will probably need to look quite hard to get something to reduce your risks.